Sheridan House. Paperback. POOR. Noticeably used book. Heavy wear to cover. Pages contain marginal notes, underlining, and or highlighting. Possible ex library copy, with all the markings/stickers of that library. Accessories such as CD, codes, toys, and dust jackets may not be included. Sheridan House, Incorporated, 1991. Paperback. Very Good. Disclaimer:A copy that has been read, but remains in excellent condition. Pages are intact and are not marred by notes or highlighting, but may contain a neat previous owner name. The spine remains undamaged. At ThriftBooks, our motto is: Read More, Spend Less.Dust jacket quality is not guaranteed. Sheridan House, Incorporated, 1991. Paperback. Good. Disclaimer:A copy that has been read, but remains in clean condition. All pages are intact, and the cover is intact. The spine may show signs of wear. Pages can include limited notes and highlighting, and the copy can include previous owner inscriptions. At ThriftBooks, our motto is: Read More, Spend Less.Dust jacket quality is not guaranteed. Sheridan House, Incorporated, 1991. Paperback. Acceptable. Disclaimer:A readable copy. All pages are intact, and the cover is intact. Pages can include considerable notes-in pen or highlighter-but the notes cannot obscure the text. At ThriftBooks, our motto is: Read More, Spend Less.Dust jacket quality is not guaranteed. Sheridan House. PAPERBACK. 0924486201 Ships promptly from Texas. . Very Good. 1991. Sheridan House. Used - Good. Good condition. Sheridan House, 1991. Very Good condition Softcover Octavo, 1991 edition. Inscribed and signed by the author. Light wear.. Inscribed and Signed By Author. 2nd Edition. Paperback. Very Good. 8vo - over 7" - 9" tall. Book. NEW Y ORK: SHERIDAN HOUSE INC., 1991. Soft cover in very good condition. Front cover illustrated with a color picture. Cover and page edging are slightly soiled. Leaves are clean. Has a small brown stain at the bottom between the title page and the front fly paper. Has 324 page's.. SOFT BACK. Very Good/N/A. Sheridan House, 1991-01-25. Paperback. Good. Excellent customer service. Prompt Customer Service. Sheridan House, 1991. Trade paperback. Very good. Trade paperback (US). Glued binding. 324 p. Contains: Illustrations. Audience: General/trade. 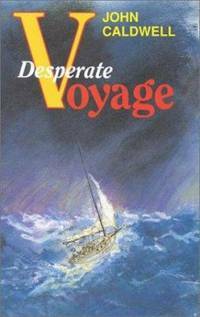 V DESPERATE VOYAGE BY JOHN CALDWELL-SIGNED BY AUTHOR AND SIGNED BY PREVIOUS OWNER-SOFTCOVER CONDITION VERY GOOD-COPYRIGHT 1991-324 PAGES. Sheridan House, New York, 1991. Soft cover. Book Condition: Very Good. No Jacket. 8vo-over 7Â¾"-9Â¾" tall. The author's account of his voyage. Sheridan House. Used - Acceptable. Ships from the UK. Former Library book. Shows definite wear, and perhaps considerable marking on inside. 100% Money Back Guarantee. Your purchase also supports literacy charities. Sheridan House. Used - Good. Ships from the UK. Shows some signs of wear, and may have some markings on the inside. 100% Money Back Guarantee. Your purchase also supports literacy charities. Sheridan House. PAPERBACK. 0924486201 Special order direct from the distributor . New. Sheridan House, 1991-01-25. Reprint. Paperback. Used:Good. 1991-02-02. Good. Ships with Tracking Number! INTERNATIONAL WORLDWIDE Shipping available. May not contain Access Codes or Supplements. May be ex-library. Shipping & Handling by region. Buy with confidence, excellent customer service! Sheridan House. PAPERBACK. 0924486201 Like New Condition. . Fine.